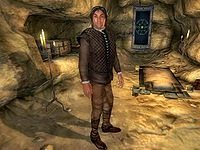 Erthor, a Bosmer sorcerer, is an Apprentice of the Skingrad Mages Guild. However, because of a few hazardous incidents, including one involving a scamp, he was told to practice at Bleak Flats Cave, northwest of the city, by Guild head Adrienne Berene. Erthor returns to the Skingrad Guildhall twice a week to check in. You will first meet him during the Skingrad Recommendation quest, when you are sent to rescue him from undead creatures that have overrun his new home. Both before and during the related quest, he will wait in the last room of Bleak Flats Cave, surrounded by zombies and not even eating or sleeping, until you come to his rescue. Depending on your choice, he will then either follow you to the Guild Hall or make his own way there to meet up with Adrienne Berene. After the related quest is over, he divides his time between the Mages Guild and the cave. He devotes the time from midnight on Morndas to 8am on Tirdas to visiting the guild, spending his weekly sojourn in the Living Quarters. At all other times he can be found in Bleak Flats Cave where he will eat for two hours every day at 6pm and sleep for 9 hours beginning at 11pm. He wears middle-class attire consisting of a quilted doublet, tan linens and a pair of doeskin shoes. He also carries a small amount of gold. He carries no weapons, relying instead on a leveled set of standard conjurer spells. He has made the final room of Bleak Flats Cave his home, decorating it with a Mages Guild banner, a bedroll, a chest and table. On the table you will find a copy of the light armor skill book Lord Jornibret's Last Dance. His chest, which is locked, contains some gold, a small chance (25%) of a potion, scroll or soul gem and a very slim chance (10%) of alchemy apparatus, ingredients or gems. Next to his chest you will find some spare clothing, a pair of tan linens and a quilted doublet. When you arrive in Skingrad, you may overhear citizens and guild members talking about a strange, but relieving disappearance: "I hear one of the guild mages has gone missing again. ", "Have you seen Erthor around town lately? ", "It seems quieter than usual at the Mages Guild. ", "Is it me, or is it quieter around here with Erthor missing?" and "Any sign of Erthor lately?" However, when you ask the distracted guild head Adrienne Berene for a recommendation she will say: "My research occupies nearly all of my time. Now that I think about it, I do have a small problem concerning Erthor. He's one of the guild mages here. Think you can do something about it?" If you accept, she will continue: "Excellent. I just don't have the time to search for him again, but I do need to consult him about some notes he borrowed. You might want to ask around, and see if anyone can be of some help. Let me know when he's back, and you'll have your recommendation." When asked about Erthor she will hesitantly admit: "He's... well, he's an interesting fellow. Sulinus Vassinus can tell you more about him, if you wish to know." She will send you on your way with: "Have Erthor see me when he gets back, Associate." "Where's Erthor? I haven't seen him lately." "He's probably still out at the cave. Adrienne hasn't let him work here in a long time." "I know, but he usually stops by once a week or so. I don't recall seeing him lately." When you finally locate Erthor in his cave, he will appear calm on the outside. 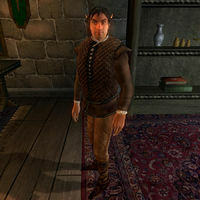 However, speaking to him reveals why he hasn’t showed up in Skingrad recently: "You... how did you get in here? Are those horrible creatures gone? I'm not going anywhere until they're gone! Horrible things!" He is referring to the seven deranged zombies who has invaded his peaceful cave and will elaborate if greeted again: "Are the creatures gone? I want to get out of here. I've been trapped for days! I don't dare move a muscle until they're all dispatched!" Despite the chaotic situation, you can now ask him about the benefits of the Mages Guild: "The services provided at the Arcane University are just priceless. You can create your own enchantments there!" When the cave is clear, Erthor will be relieved and ask: "They're all gone? I can leave the cave? Oh, thank you! I'm ever so grateful! You're heading back to Skingrad, aren't you? Could I... maybe come with you? It'd be safer, I think. So, what do you say?" If you deny his request, he will say "Oh. Well, I guess I can do that. I'll see you there, then... I hope." and journey back to Skingrad on his own. If you accept him as a follower, he will instead say: "Oh, thank you. You're just too kind." 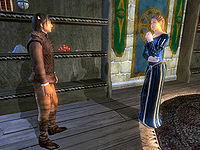 He will then follow you wherever you go; if you engage in conversation he will say: "I hope we'll get to Skingrad soon. I've had enough of the wilderness for now." and will repeat this statement after the conversation: "I can't wait to be back in Skingrad, safe and sound." Erthor: "Adrienne, I'm back! I was rescued!" Adrienne: "So it would seem. You are unharmed, I presume?" Erthor: "Well, my pride is a little wounded..."
Adrianne: "Oh, spare me. You're lucky I bothered to send someone after you at all. In the future, would you please be more careful?" Erthor: "Erm, well... yes. I'll just pack up my supplies and be on my way, then. Thank you for sending someone to help me." After this cold reunion, asking Adrienne about a recommendation will net you: "I've spoken with Erthor, who seems to be all right. Good work. I'll see to it that your recommendation is sent in, as soon as I have a free moment." This will complete the quest and make Erthor return to his normal routine. The other guild members and some townsfolk will start chatting about the pros and cons of Erthor's return: "I saw Erthor earlier. Guess someone rescued him again. Hide your scrolls while you can. ", "Sounds like the Skingrad branch of the guild can't even keep track of its members. How appalling. ", "I heard that one of the Skingrad mages was assaulted, but I don't know the details. ", "I saw that Erthor is back in town again. ", "I smelled a strange odor coming from the Mages Guild yesterday. Erthor must have been doing another experiment." and "Erthor is causing trouble at the Mages Guild again. Seems his experiments are always blowing up." If you delay returning to Skingrad at the end of the quest, Erthor will follow you indefinitely, allowing him to help with other quests. Erthor was supposed to encourage you to join the Mages Guild, but since Bleak Flats Cave can't be accessed before the related quest, the dialogue can never be heard: "I wouldn't have any friends if it weren't for the guild. I'm very grateful. If you want to join, you should talk to Adrienne." Esta página foi modificada pela última vez à(s) 21h45min de 1 de janeiro de 2016.